Tim Burton and Johnny Depp's trip down the rabbit hole drew huge crowds, as "Alice in Wonderland" earned a whopping $116.3 million in its opening weekend - a record for a 3-D film. The surprisingly huge total easily surpassed all other films in release and gave Walt Disney Studios an even bigger opening than that of the hugely popular 3-D film "Avatar." It also marked the biggest opening weekend for a non-sequel. "This is just one of those cultural phenomenons that has caught everybody's interest," said Chuck Viane, Disney's president of distribution. "They don't come like this very often." The film beat forecasts that ranged between $65 million-$75 million, and the surprising results added some intrigue to Oscar Sunday. Before the weekend, Disney and 20th Century Fox competed over the available 3-D ready screens; screens outfitted for 3-D are rapidly rising, but still amount to fewer than 4,000 in the U.S. and Canada. Before "Alice," many of those screens were still dedicated to Fox's box-office behemoth, "Avatar," which is up for nine Academy Awards on Sunday, including best picture. In its 12th week of release, "Avatar" earned $7.7 million over the weekend, bringing its cumulative domestic total to $720.2 million. Asked whether fewer 3-D and IMAX screens hurt "Avatar," Chris Aronson, head of distribution for Fox, said, "No question." "Are we disappointed? Sure," said Aronson. "But there are certain market forces that are beyond anything we can do. To have an 11-week window is pretty much unheard of. It certainly allowed this movie to be discovered and witnessed by so many people." "Avatar" isn't disappearing, though, and it can be expected to regain 3-D and IMAX screens, especially if it wins best picture. "We'll have that negotiation tomorrow morning with exhibition, without a doubt," said Aronson. It also seemed likely that "Alice" benefited from the "Avatar"-effect in galvanizing audiences for 3-D movies. "Alice in Wonderland" is the first film released in 3-D since James Cameron's epic. 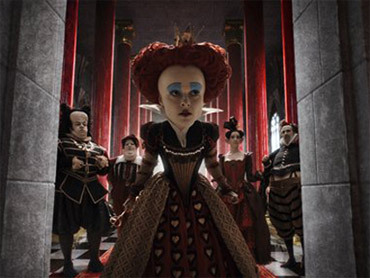 "Alice" was shot in 2-D, but transferred to 3-D in post-production. The weekend's second best performer at the box-office was Overture's "Brooklyn's Finest," Antoine Fuqua's gritty police thriller, which earned $13.5 million in its first weekend, according to studio estimates. Martin Scorsese's "Shutter Island" for Paramount followed closely with $13.3 million in its third week of release, bringing its cumulative total to $95.8 million. Warner Bros.'s comedy "Cop Out" came in fourth, adding $9.1 million for a two-week total of $32.4 million. But "Alice" thoroughly dominated the weekend, surprising even Disney. Worldwide, it took in $210.3 million. It was a record release for the first quarter of the year, typically a time of lower box-office expectations and critically acclaimed Oscar contenders. The previous first quarter record was Mel Gibson's "Passion of the Christ," which opened with $83.8 million in Feb. 2004. "We went into Friday thinking that we really had a big hit with us, and then all of a sudden the numbers started to roll in," said Viane. "Alice" went on to make $41 million on Friday alone. "We said, `Oh my gosh. This is bigger than any of us could have anticipated," said Viane. Though reviews were mostly respectfully negative, much of the film's draw was surely in teaming director Burton and his frequent collaborator, Depp, who plays the Mad Hatter. It also presented moviegoers with a 3-D updating of Lewis Carroll's beloved classic. Though at times dark, it gained a PG rating from the MPAA (for, among other things, "a smoking caterpillar"), which meant a large number of kids could attend. But it proved once again how significant the draw of 3-D is to moviegoers. The technology repeatedly has inflated box-office grosses for everything from "Avatar" to "Cloudy with a Chance of Meatballs." "Alice" also played across 188 IMAX screens in North America and gave IMAX its best opening ever, with $11.9 million domestically. That beat the previous record of $9.5 million set by "Avatar." IMAX chairman and president Greg Foster said the huge success of "Alice" was unexpected, but that "Avatar" would regain some of those IMAX screens, whether or not it wins best picture. "The momentum on 3-D is so massive right now," said Foster. "They were ready for a new movie. They were ready for a new, cool 3-D experience." Though most of the Oscar contenders weren't a big factor at the box-office Sunday, the boffo performance of "Alice" proved the good health of Hollywood, said Dergarabedian. 1. "Alice in Wonderland," $116.3 million. 2. "Brookyn's Finest," $13.5 million. 3. "Shutter Island," $13.3 million. 4. "Cop Out," $9.1 million. 6. "The Crazies," $7 million. 7. "Percy Jackson & the Olympians: The Lightning Thief," $5.1 million. 8. "Valentine's Day," $4.3 million. 9. "Crazy Heart," $3.4 million. 10. "Dear John," $2.9 million.